Step inside the staircase of a Bramley home which has been turned into a scene from JK Rowling’s wizarding world. Harry Potter superfan Catherine Hamilton-Edwards has the backdrop of the film in exquisite detail, much to her husband's dismay. 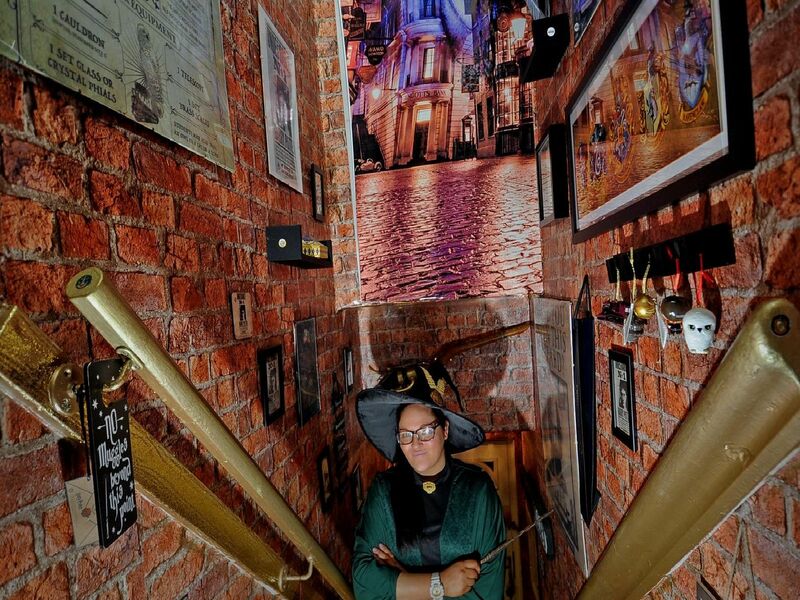 A Harry Potter superfan has transformed the staircase of her Bramley home into a scene from JK Rowlings wizarding world. The hallway walls are decorated with a giant Diagon Alley mural and has a Nimbus 2000 quidditch broomstick suspended above the staircase. Catherine spent two weeks hand painting and glueing blue and gold glitter all over the ceiling to recreate the moving, bewitched roof in the Great Hall at Hogwarts. Hagrid's lantern with Scabbers (Ron's rat) also sits in a corner. Catherine said: It all began with me buying a metal sign of Platform 9 and 3/4 and I wanted to put it up in our living room, however, my husband said no but that I could put it on the staircase as it wasnt really a room."